:Test chemicals Vineger,laundry detergent,Starbucks coffee,Dunkin donuts coffe,orange juice,Baking soda,Caprisun,and Gatorade. Peel off six cabbage leaves and put them in a blender with five cups of water. Pour the purplish cabbage liquid though a strainer to filter out all of the big chunks of cabbage. Set out three graduated cylinder or glasses side by side. Fill each container half full with cabbage juice. Add a little vinegar to the first glass of cabbage juice. Stir with a spoon and notice the color change to red which indicates that vinegar is classified as an acid. In the second glass, add a teaspoon of laundry detergent. Notice how the liquid turns green indicating that this chemical is a base. Keep these two glasses of red and green liquid for future reference . Try adding other test chemicals to a small amount of cabbage juice and note the color change to determine if the chemical is an acid or a base. Try soaking some filter paper in concentrated cabbage juice. Remove the paper from the cabbage juice and hang it up by a close pin to dry. Cut the dry paper into thin strips. Dip the strips into various liquids to test their pH. The redder the strips turn, the more acidic the liquid is. The greener the strips turn the more basic the liquid is. we need to be by a outlet to plug in are blender. 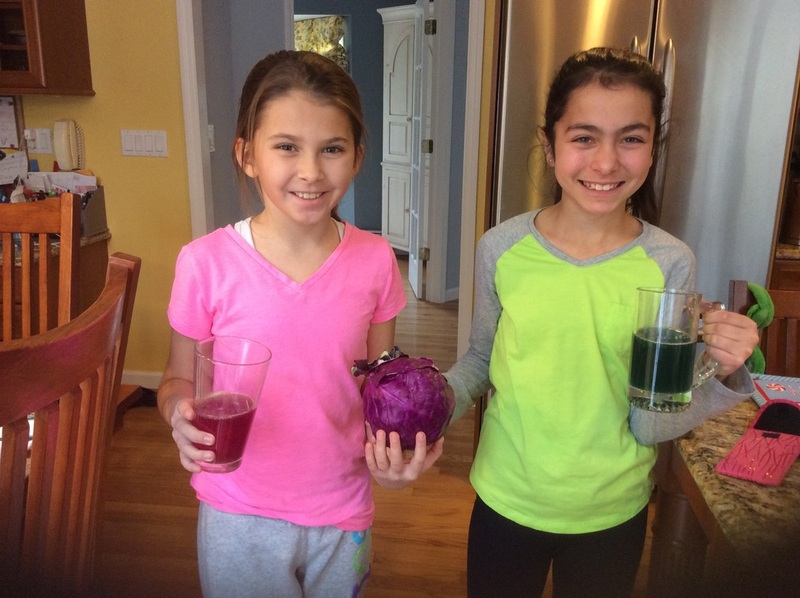 The cabbage juice will turn red because it's a acid. Most of the things we eat an drink are acidic not basic. Hi my name is Victoria Olsen I'm in Mrs.Carvo's class. Some of my hobbies are soccer,lacrosse,basketball and I love to do science. Hi my name is Emily Esposito. I'm in Mrs Luke's class. Some of my hobbies are soccer, basketball and I love to do science. Question: There needs to be a question for your experiment, What are you trying to answer? Safety Procedure: Be more specific about the materials. Can they be harmful if they get on skin, or in eyes? Observation: Will there be enough of opportunity for all participants to actually participate in the experiment? Science Behind it: Explain why the colors prove that the mixtures are acids and bases. Why do they change certain colors?